"This cake uses crushed cookies instead of flour. It is a great cake for kids: they will love crushing all those cookies." Preheat oven to 300 degrees F (175 degrees C). Grease and flour a bundt pan. Cream butter or margarine; add sugar, and beat until smooth. Add eggs, one at a time, beating well after each addition. Stir in crushed vanilla wafers alternately with milk. Add coconut and pecans, and mix until blended. Pour batter into prepared pan. Bake for 1 1/2 hours. Cool. This was great. The guys in my house loved it and ate it up before I could get a picture of it to post. I added some melted vanilla icing to it as well. Incidentally, it's great for breakfast. Very moist and dense cake. 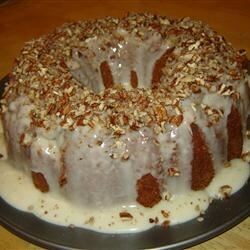 Reminds my hubby of applesauce cake. He loves it..I will make again and again. Thank you for the recipe. In our Vanilla category, this recipe was the Best. Tasters liked the moist flavorful cake and the students loved crushing the cookies. Fun and Tasty!